Home » Jeezny » Polyarchy, foxes, wolves and other stuff. Polyarchy, foxes, wolves and other stuff. In Doctrines and Visions, Chomsky alludes to notion that there are, at any one time, only a minority of men capable of ruling since most men are beasts. Since the Revolution in England in the seventeenth century, democracy hasn’t been about the multitude of “beasts in men’s shapes” but rather the concentration of power in the hands of the few. These “men of best quality” serve to ensure that “a system of elite decision-making and public ratification” is enshrined: “polyarchy” is the term. This famous and supposedly precocious political thinker Machiavelli, whose name is nowadays an adjective meaning anything from “devious” to “self-serving,” wrote The Prince as a CV for a job in the administration of Lorenzo De’ Medici of Florence. In it, he says more or less that he has an understanding that men generally do not have and that, while he has access to knowledge and insight that may be unsavoury, it is no less essential for it. 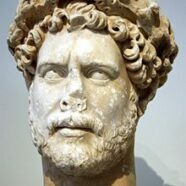 What man sees: Hadrian through the eyes of Margarite Yourcenar. Alex Bellos’ Alex Through the Looking Glass:” How Life Reflects Numbers and Numbers Reflect Life. a cut parallel to the side makes a parabola, and all deeper cuts make a hyperbola. So, a parabola is always the result of a cut that follows the angle of the side of the cone while any cut that starts at the side and finishes in the base and isn’t parallel is a hyperbola. A parabola by the way must also end in the base rather than run from side to side if it is to be a parallel cut. Bellos tells us that the Greeks studied these “conical sections” for their own sake but that they had “momentous applications” later on. The difference between circles and ellipses is that circles are made by starting with a centre point, the origin and drawing a line that is equidistant from said point until the line finds itself again after moving through 360 degrees. To make an ellipse you need two points. You put a looped string, say, around the point so that it looks a little like the track of the circus maximus maybe. Then, you take a pencil and push one side of the string to the side away from the other side of the loop and draw a line. The further apart the two points are the less a circle the line resembles; the closer the more the like a circle. This is important because it exposes another difference between circles and ellipses other than how they’re constructed. Circles are all the same shape; the only difference is size. The same is not true for ellipses which all look slightly different. You can shrink a big circle so that it will eventually look exactly like a smaller one; you cannot do this with ellipses. What’s more, ellipses can always be viewed to resemble circles and the same with circles: they can be viewed at particular angles so that they resemble ellipses. I think the admin of this web site is really working hard for his website, because here every data is quality based material. Excellent post. I used to be checking constantly this blog and I’m impressed! Very helpful info specially the closing phase 🙂 I handle such info much. I used to be seeking this particular information for a very lengthy time. Thank you and good luck.